Five magnificent stops between Honolulu and Guam filled with spectacular scenery along the way, and then back again. Join Big Metal Bird host, Phil Torres, as he explores our unique Island Hopper route, and discovers what the route means to the people of Micronesia. Image of Watch the new Big Metal Bird: Something to drink? Watch the new Big Metal Bird: Something to drink? If a United beverage cart could talk, it would tell you how we select the brands we serve in the sky. But since they can't talk, host Phil Torres will have to spill the proverbial beans. Join him as he visits an illy Caffè and the family behind Colby Red wine. Ever wonder what happens at United when weather hits? Join BMB host, Phil Torres, as he visits Denver International Airport as United prepares for a snowstorm and gets a front row seat for all the action. United operates a Hub and Spoke Route Network System. The connectivity our network provides makes it even more convenient for our customers get to destinations all around the globe. Join BMB host, Phil Torres, as he talks with Scott Kirby, President of United Airlines, to learn more about the system. Boeing and United's relationship dates back to 1931 and they continue to share a partnership today. Join Big Metal Bird host, Phil Torres, as he gets an all-access tour of Boeing and learns how to build an airplane, specifically a 777-300ER. United's MileagePlus® is the world’s most rewarding loyalty program℠, with a wide array of travel, credit card and retail partners. MileagePlus members may earn elite travel benefits, including Premier Access® airport services, and have access to one of the most extensive merchandise redemption programs in the industry. With United’s industry-leading global route network, no other airline offers more destinations for award travel. This year, United took its industry leading app, and made it even better. 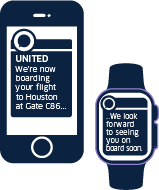 The updated United app is the perfect travel partner, moving with customers to provide the most useful information at each step of their journey. United offers complimentary entertainment options at each seat on all wi-fi equipped aircraft, providing customers with a library of movies and TV shows to watch throughout their flight. More than 50 United Club℠ locations and lounges in 31 airports worldwide offer members complimentary bar service, light snacks and beverages; business amenities such as Wi-Fi, wireless printing and workstations; and personalized assistance with reservations, seat selection, upgrades and boarding passes. United Continental Holdings, Inc., is listed on the Nasdaq under the ticker symbol “UAL” and began trading on Sept. 7, 2018. United delivers leading customer service, meaningful profitability and sustainable long-term value for our shareholders.